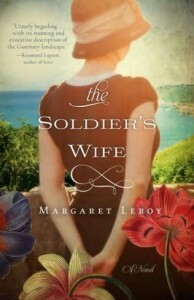 Margaret Leroy’s new novel THE SOLDIER’S WIFE takes place on the island of Guernsey before and during WWII. I absolutely adored it! And it will be available in trade paperback on Tuesday, June 28. Vivienne de la Mare is living with her two young daughters and her ailing mother-in-law as this compelling new novel begins. Her husband has already headed out to fight the war against the Nazis. Left behind, Vivienne is steeped in dilemmas that are both moral and life threatening. But the immediate decision foisted on Vivienne is whether to evacuate the island and go to London, or stay and hunker down. Tension mounts quickly while Vivienne makes this you-can’t turn-back decision. This is where I became a total captive of this book. That Vivienne has been living in a loveless marriage since the onset, gives credence to her decision to allow herself an affair with Gunther, a young German officer living next door. Gunther offers kindness and gifts. And something Vivienne has never experienced: passion. What happens when vital young people are thrown together during wartime? When everything they know turns upside down? And death is a very real option everyday? There are scenes of devastation when the island is bombed and the Germans arrive and begin their infiltration into everything Guernsey. Hardship comes slowly as food begins to run out. Islanders begin to distrust other islanders. War has indeed arrived on this once very safe and sheltered paradise. One of the most important lessons I received from this novel was that even the German officers holding the island captive did not realize how insane Hitler had become until it was much too late. The horror bestowed on the world was also bestowed on many German soldiers. Margaret Leroy has written a page-turner of a book that I read in one day. I could not put it down. I am getting great feedback from other booksellers saying they felt the same way. Each character has been drawn so realistically that I felt like I was reading about people I know. Leroy has struck a vein with this one. How would you deal with taking sole care of two vivacious girls and a mother-in-law who was not only on her last legs but not quite right anymore? If there is one fault I have with this book, it is that Vivienne, at times. was made to be such a saint. But it also makes her choices so heartfelt. Over the past several years I have had countless customers and good friends recommend THE GUERNSEY LITERARY & POTATO PEEL PIE SOCIETY. I have tried to read it three times. The format of the story, being told in letters, stopped me each time. I am here to tell you that if you loved Potato Peel Pie, you will go nuts over THE SOLDIER’S WIFE. It is hands down a better book. At least, it was for me. Do yourself a favor this summer. Get your self a copy of this fabulous novel by Margaret Leroy. I think it will make you very happy.